The warehouse giant is looking to outshine peer retailers with its post-Black Friday quarterly update. It has been a good year for the country's biggest retailers, with Walmart (NYSE:WMT), Costco (NASDAQ:COST), and Target (NYSE:TGT) each outpacing the broader market so far in 2018. Costco stock has been beating its peers by a wide margin, though, heading into the final weeks of the year. The warehouse giant's fiscal first-quarter report is coming after generally positive announcements from Target and Walmart for the period. However, there are some good reasons to expect the retailer to outshine these rivals again in its final report of the year, set for Thursday, Dec. 13. Like Target and Walmart, Costco is seeing some of its fastest growth in years right now. Customer traffic shot up 5% in the most recent quarter, which allowed sales at existing locations, or comps, to jump 7%. This result trounced Walmart's 4.5% increase and even edged past Target's blockbuster result for the quarter. Both its peers reported a minor slowdown for the following period, and Costco is likely to do the same on Thursday. Yet its monthly sales figures suggest comps gains should land at around 7% compared to Walmart's 3.4% and Target's 5.1%. Each of these companies counts on aggressive pricing to drive customer traffic, but only Costco has the benefit of a huge base of membership fees it can use to keep prices low. That advantage is getting stronger, too. Its membership renewal rate is inching up toward a record high 91% even as its subscribers pay higher annual fees. Combine those two trends and you get an even bigger haul that will allow Costco to maintain its price leadership. For that reason, investors will be watching key membership metrics like subscriber renewal rates and overall membership income for conformation that the warehouse retailer's key competitive advantage is as strong as it has ever been. Costco is growing at a faster pace than rivals, but what really sets the chain apart is its enduring profitability. Target and Walmart are seeing margins shrink as they shift their businesses toward multichannel retailing, but Costco isn't having the same challenge. In fact, its operating income is reaching new highs while its peers are struggling with shrinking operating margins. Costco is facing increased spending requirements, too, including in an e-commerce segment that's becoming more important to its broader business. The company is investing heavily in building out its delivery network, for example, including with ultra-quick delivery for perishable merchandise. However, this spending shift shouldn't hurt profitability as much, thanks to the retailer's steadily growing base of membership fee income. 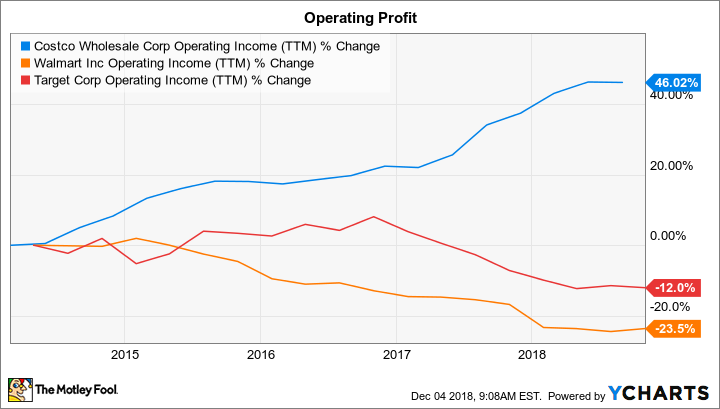 For confirmation that this favorable trend is holding up, look for Costco's operating profit to march higher even as rivals move in the opposite direction. Costco doesn't issue a short-term growth forecast, but CEO Craig Jelinek and his team should have plenty to say about how demand trends are looking at this critical selling period. Unlike Walmart and Target, which reported their results just before Black Friday, Costco will have the benefit of actual sales results for the peak shopping period when it discusses its outlook for the coming quarters on Thursday. Three months ago, that outlook reflected the management team's confidence as they saw robust membership growth and strong customer traffic to end fiscal 2018. Given the stock's run-up lately, investors are expecting those positive trends to continue into the new fiscal year.